Year 1924 marks the centenary year of Royal Dutch Lifeboat Society. 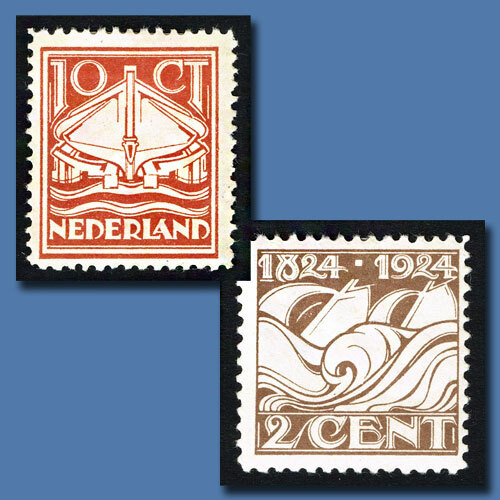 On the occasion Dutch Post issued two commemorative stamps in the month September. "Netherlands" literally means "lower countries" having most of the areas below sea level meets with a constant threat of floods. Hence, the Royal Dutch Lifeboat Society, now called the Royal Netherlands Sea Rescue Institution, was founded in 1824 as a voluntary association tasked with saving lives at sea. To celebrate the 100th Anniversary of the Royal Dutch Lifeboat Society, two special commemorative stamps were issued. The 2cents stamp featured an abstract design of a ship in distress with the years 1824 and 1924 at the top and the denomination at the bottom. The other stamp with the denomination 10 cents features a life boat with the denomination at the top and the name of the country at the bottom. Royal Dutch Lifeboat Society, today, maintains 39 lifeboat stations along the Dutch coast. Between 1824 and 2006, they answered 36,358 distress calls and have rescued 79,887 people from distress situations. This institution is entirely financed by public donations.